While I was on what I like to call my hiatus, I discovered a new nail blog. It's called Nail Care HQ.Com and it is no BS. This blogger, Ana, has done the research that most of us are too lazy to do, myself included. Ana has opened my eyes to the world of nail care and the lies and half truths we fall for time and time again. Most of us use what we think are nail strengtheners or things that claim to help grow nails faster and harder. Well in reality, there is no product that can claim to do this. This link will explain this myth to you. I must say, that I was very saddened to read this. Because I have spent so much money trying to grow pretty nails and up until recently, Trind was my go to product. Then Nail Care HQ debunked my Trind love. But first, Ana debunks Zoya's Qtica nail hardener here. It is amazing what we all believe in and how companies can get away with telling us these half truths and we go and spend all this money for what? What Ana does prove is that nails need to be 18% water and 5%o oil to be healthy. Nails grow at the rate your DNA is programmed for. In reality, nails are dead. Ana does mention getting pregnant or moving some place warmer as the true means of making your nails grow faster. What Ana is touting is nail health and not spending the billions we spend on products that won't do anything for your nails. Ana also talks about how Jojoba oil is the closest to Sebum oil, which is the only oil your body recognizes and absorbs. She has made her own oil concoction that you can buy. I am not being paid to say these things. I bought all these products on my own and am convinced that it is true. I am in love with this oil and have followed her steps she describes here. Here is a picture of what I'm talking about. I have already gone through a bottle of this stuff! You can buy this stuff here. Her newest adventure has brought her into the base and top coat realm. Ana states the top coat is similar to Seche Vite, maybe not as shiny and won't get thick halfway through the bottle. I must say I tried this yesterday and besides it being stinky-Seche is too, my nails were dry to the touch in less than 3 minutes. It might have been even faster, but I'm afraid to even touch my nails for an hour after painting! Also it seemed just as shiny as Seche to me, although I have not done a side by side yet. Her base coat is a ridge filler and I was really impressed when I used it. Here are pictures of these two. I am not sure if Ana makes this stuff herself, or is just selling it on her site. All I know is that I trust her and her research and so far am loving her and her information as well as her products! Now on to the Taboo stuff. Are you ready? Did I trick you? Were you expecting more myths and debunking? This is Chanel Taboo. I just got this and had to try it out since the sun was out in full force. Here are way too many pictures. I did not do any nail art, because it's just too pretty! Are you freakin kidding me???????? This is a stunner for sure! 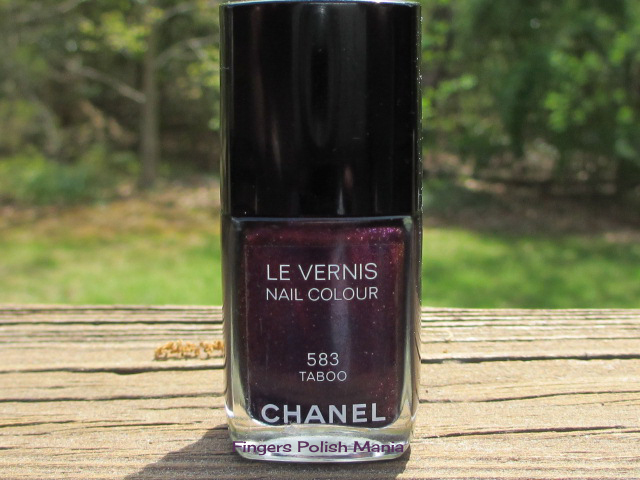 This is a deep dark purple with a red, blue and purple shimmer fest inside it. I showed you this in different lights so you can see how it looks. There is not a bad angle with this polish on! I did use the Simply Quick Top Coat on this and it's plenty shiny for me. You all know how I love me some shiny! Please go and learn for yourselves the truths about nail care and the products out there. I have stopped buying any other products and am using this oil religiously.